Remembering the good times in basement-level knotty pine rooms. Mr. Roosevelt came home with me the other day. 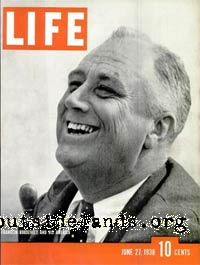 Until the move, the framed full-page LIFE magazine photo, depicting FDR at his jauntiest, had stood silent sentry on a wall above an old upright piano in one of those knotty pine downstairs rooms that were once so common in Sunset District homes. Today, such places are fading quickly from the scene, as new owners convert them into studio apartments or the latest real estate must-have: a "man-cave." 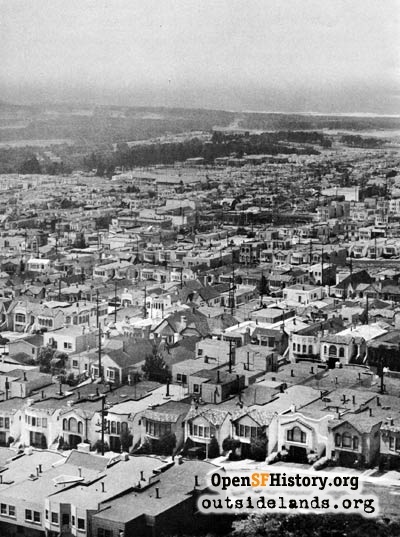 Back in the day when the firms of Charles J. O'Callaghan on Taraval Street, James Sullivan on West Portal Avenue, or Julius Saxe on Noriega Street were selling Sunset real estate, a standard phrase in their advertising read simply "Knotty pine down + ½ ba" and everyone knew exactly what that meant. The phrase still evokes images of generations of happy family gatherings, New Year's Eve celebrations with noise makers and party hats, plus a console radio or an old upright piano in the background, and a marvelous array of glassware for every type of drink imaginable lined up on back-lit glass shelves behind a built-in wooden bar. For the past 72 years, Mr. Roosevelt watched over it all in a downstairs knotty pine room on 24th Avenue near Noriega, his place of honor having been conferred on him by the original owners, Ann and Charles, when the house was new back in the 1930s. It was their subtle little way of saying "thank you" to the man whose fiscal policies transformed them from renters into homeowners, thus ensuring their family's financial stability for generations to come. Ann and Charles were the grandparents of a St.Ignatius classmate, and I met them back in the late 1960s when their grandson and I were attending the old S.I. on Stanyan Street. 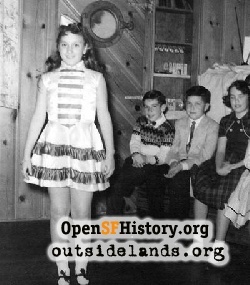 They were, to use one of Ann's favorite descriptions of others, "just grand people"—old time San Franciscans born before the Fire. 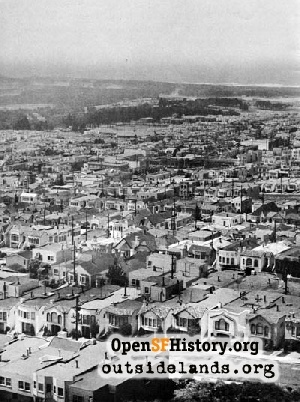 Ann grew up with seven brothers and sisters on 10th Avenue near Geary, in a Victorian house that remained in her family for nearly 100 years, until her last sister died in 1988, when it was sold and demolished by the new owners a few years later for a new structure. Ann and her siblings attended nearby Star of the Sea Academy, where one of their classmates was another Richmond District youngster who grew up to become the famous comedienne, Gracie Allen. Ann and Charles met in 1922 year at a Valentine's Day party held "in one of those new flats near the police station on 24th Avenue above Taraval," and were married later that year, during the week between Christmas and New Year's. They raised two daughters in a series of apartments until the miracle of the Federal Housing Association loan enabled them to buy their first and only house just over the hill from the place where they met. Mr. Roosevelt assumed his rightful place on the wall of their knotty pine room down shortly after move-in day. 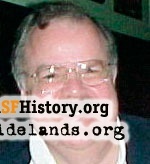 Charles earned excellent wages as a union electrician, and there was no shortage of work from the time that he began installing wiring for some early SF Financial District high-rises in the 1920s, lights on the Golden Gate Bridge in the mid-1930s, through all of World War II, the boom years of the 1950s, and right up until his retirement in the late 1960s. An enormous painted sign in the garage of his home remains as a souvenir from his days supervising a lighting improvement program at the old Kezar Stadium, under the auspices of Mayor Elmer Robinson, circa 1950. Ann was a stay-at-home Mom, but once the girls were older, she indulged in her love of stylish clothing by taking a part-time sales position at the old White House Department Store. It was the hey-day of downtown retailing back then, with stores open only "business" hours, along with Monday nights until 8, and closed on Sundays. The White House went one step further and even closed on Saturdays during the summers so that the employees could spend more time with their families during school vacations—truly a vanished age. A Sunset District party in a knotty-pine bonus room behind garage. March 1956. - Courtesy of Frank Dunnigan. Ann was a wonderful cook and she and Charley hosted parties that were legendary. They could both pour the perfect Manhattan, and they indulged their guests, even the younger ones, since we were always under their close scrutiny. Their traditional gathering was Christmas Eve, with a wonderful combination of family, friends, neighbors, and everyone's co-workers. The open house began with hors d'oeuvres and a drink or two in the early evening. At about 10:30 p.m., most of the group would progress en masse to Midnight Mass at St. Ignatius. By 1:30 a.m., it was back to the house on 24th Avenue for a buffet of ham, turkey, salads of all sorts, baked beans, hot chocolate, and glasses of champagne. The old Herman's Delicatessen at 8th and Geary was the source of much of what filled the buffet table, with desserts usually coming from the Golden Brown Bakery on Irving Street. Ladies were always "dressed up" for the occasion, and the men generally wore coats and ties. Even as a high school student, I joined in the ritual by wearing a natty three-piece suit and a festive Christmas necktie, something that I have not done in a good long time lately. Chatting with older folks who were eager to share a lifetime of stories that usually began with, "I remember when…" was a great rite of initiation for this future history buff. 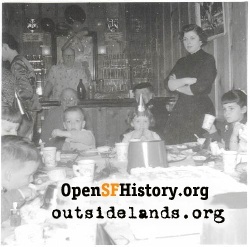 The festivities would inevitably spill over from the living room, dining room, and kitchen and into the downstairs room that held a bar, a built-in record player, and an old upright piano…yet another disappearing relic of San Francisco homes. Occasionally, one of the parties might end before dawn, but more than once, the sun was coming up by the time that the last of the guests took their leave, and everyone always had a wonderful time, enjoying the hosts' hospitality. All the while, through wars, civil unrest, and economic crises, Mr. Roosevelt was quietly watching over things from his perch above the piano. Family legend had it that about 70 years ago one guest indulged herself in a few too many cocktails one night, and began ranting loudly against FDR and some of his economic programs, insisting to Ann and Charles, "You'll have to take that picture down, or else I'm leaving." Without batting an eye, Ann promptly said to the woman, "Let me show you to the door." 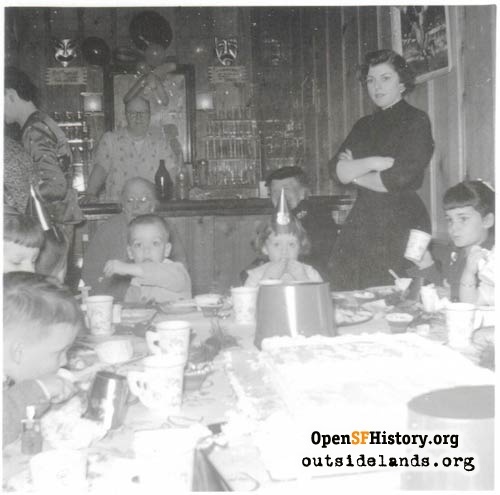 A birthday party in a knotty pine bonus room on 20th Avenue in the Sunset, 1950s - Courtesy of a private collector. 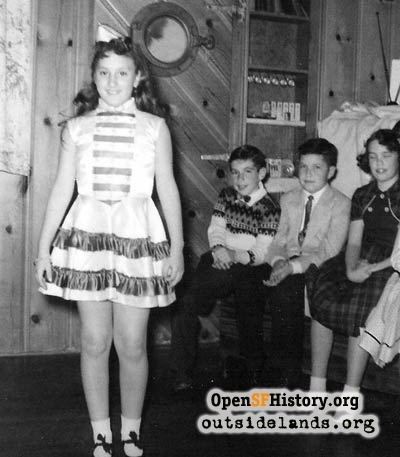 As we baby boomers came along in the 1950s, those knotty pine rooms gradually evolved into rainy-day play spaces and birthday party central, complete with cardboard cups of Arden Farms ice cream that came with tiny wooden spoons, birthday cake, pin-the-tail-on-the donkey, and lots of balloons. Lined up on benches and folding chairs at long plywood-topped tables that were covered with colorful paper tablecloths, we all helped each other celebrate our annual milestones, year after year. As the 1960s drew to a close, dust slowly began gathering on all the rows of glassware behind the bar, and the revelry began to fall silent as many old friends and family members departed for the very last time. Like many Sunset families who lacked a classic attic for storage, Ann and Charles allowed their big downstairs room to evolve into a storeroom for Christmas decorations, excess furniture, empty gift boxes from long-gone San Francisco stores like City of Paris, H. Liebes, Livingston Brothers, Nathan-Dohrmann, Ransohoff's, I. Magnin, Joseph Magnin, and the ubiquitous Emporium, plus stacks of old magazines, records, and books that were "too good to throw away." By 1972, ill health had begun to intrude on their lives, but Ann and Charles still celebrated their 50th wedding anniversary together at home. They always managed to coordinate their medical ups and downs so that just as one might need to enter the hospital for some sort of testing or treatment, the other had sufficiently recovered from his or her own health issues to assume the role of caregiver. They were there for each other until the very end, passing away less than two months apart in 1973. After Ann and Charles died, their unmarried daughter continued to live in the house—it had been her home since she was 11 years old. She was one of those beloved maiden aunts (see Streetwise, February, 2011) who had risen through the ranks of Pacific Telephone into a series of comfortably secure positions, when she retired in the early 1980s. Sadly, she recently joined the ranks of so many other beloved older relatives who have been waving that great generational goodbye to all the rest of us. Now the grandchildren of Ann and Charles are confronted with the reality that their own lives have taken them in other directions, far away from 24th Avenue. As they rapidly approach their own retirements, they have reluctantly acknowledged that the old family home no longer fits into their plans. The "For Sale" sign has gone up, and generations of household memorabilia and paperwork have been sifted through, distributed, given away, shredded, or simply discarded. Like many of us in the boomer generation, my friend and his sister were astounded by the amount of "stuff" that their relatives had accumulated in the house over the past 75 years or so. Surprisingly, they decided to entrust me with Mr. Roosevelt. Seeing him again was like revisiting an old friend. He's now hanging on the wall of my den, and I see his reflection in the mirror each time that I sit down at the computer. Even though he's left behind his beloved knotty pine room on 24th Avenue, I'm hoping that he'll enjoy life here with me. I poured a Manhattan before dinner on the first night that he was here, and we toasted the memory of Ann and Charles and their family, who were all "just grand people." Mr. Roosevelt gazed at me from across the room, and while not forgetting his long-time Western Neighborhoods home, he seemed rather pleased to be settling in and watching over things from a slightly new perspective. Page launched 2 July 2011.